(NC) Perfectly crispy and impeccably creamy, this dessert is a sweet summer treat. Paired with whipped cream, raspberries and pineapple, the cherry on top of this sundae is actually cinnamon-sugar for a delicious churro taste. 1. Line a rimmed baking sheet with plastic wrap. 2. Using a scoop, place 4, ½-cup balls of ice cream onto the prepared baking sheet. Freeze for 1 hour. Once hardened, shape ice cream with hands to round out bottoms. 3. Whisk egg white until frothy in a medium bowl. Place Corn Flakes in a shallow dish. Dip ice cream in egg to coat completely and then coat in corn flakes. Return to prepared pan and freeze for 4 hours. 4. Stir sugar and cinnamon in a small bowl. 5. Heat 2 inches of oil in medium, heavy-bottomed saucepan to 375⁰F. Add ice cream in batches of 2 and fry for 15 seconds, turning gently with a slotted spoon. Remove with slotted spoon. 6. Remove and place in 4 bowls, adding a ¼ cup of whipped topping on each. 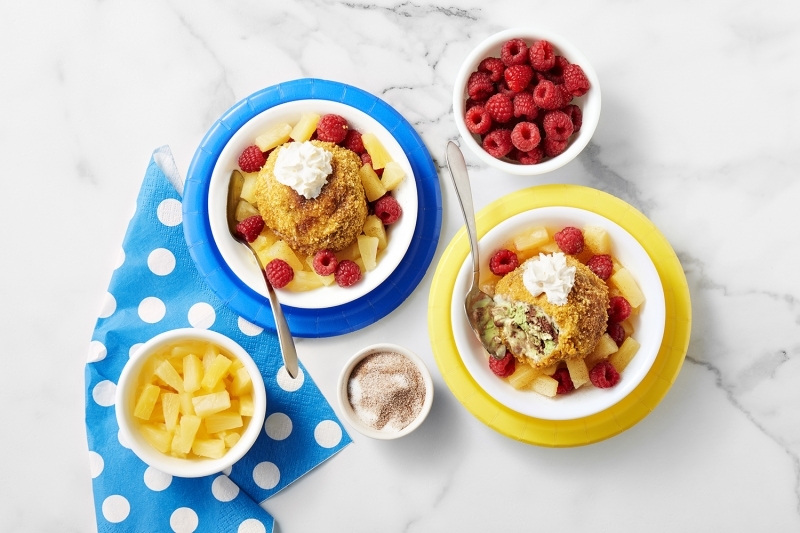 Distribute pineapple and raspberries evenly among the bowls. Sprinkle each sundae with 1 tsp cinnamon sugar. Tip: To make this dish even more authentic, drizzle with chocolate sauce and dulce de leche. Find more summer dessert recipes online at walmart.ca/recipes.